Hollywood will kill you or drive you mad. Suitable coping mechanisms include selling out, cynicism, and denial, but those are temporary measures at best. That’s the warning behind Sunset Blvd., one of the great American films. Joe Gillis (William Holden) is a fly who finds himself caught in the web of Norma Desmond (Gloria Swanson). He’s a starving screenwriter running from repo men. She’s a reclusive, washed up, yet wealthy silent film star who still thinks she’s going to have a “return” (don’t call it a “comeback”). Joe thinks he can wring some money from the old star by fixing up her screenplay of Salome. Little does he realize that it’s Norma who is taking advantage of him, buying Joe body and soul as her new pet monkey. Joe realizes how trapped he is when he tries to get away from Norma to work on a new script with a pretty young reader on the Paramount lot (Nancy Olson). Norma’s jealousy drives her over the edge, chauffeured by her servant Max (Erich Von Stroheim). Great literature can be great entertainment. Sunset Blvd.is both. It is a deliciously tense film noir, with moments of humor and romance, and it also taps into universal themes. The desire for fame and recognition is older than the movies, and selling your dignity is part of the oldest profession. But what makes great literature is, first, complete competence in storytelling — that’s the baseline. And it should also have thematic cross-references so that one part of the story echoes in many other parts. And it must have a few master strokes from the artist that suggest deeper levels of meaning, without explicitly spelling them out. There are a half dozen or more such strokes in Sunset Blvd. : Norma’s dead monkey, Joe’s golden chain that traps him in the house, the extreme closeup on Max’s gloved fingers playing the organ with a scared and tiny Joe in the background, and the opening shot from the bottom of the swimming pool are but a few. 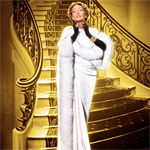 The film’s Hollywood-as-power themes resonate throughout, from the casting to the acting, even to the sets and costumes. Joe is a modern screenwriter and he speaks in a hard-boiled dialogue that contrasts with Norma’s larger-than-life silent-screen gestures. Perhaps the deepest echoes come from a scene in which Norma and Joe sit down to watch one of her old pictures while Max runs the projector. Footage from a film called Queen Kelly springs to life. That’s a film that starred a young and beautiful Swanson (Norma), and it was directed by Von Stroheim (Max). In fact, it’s a film that could be said to have ended Von Stroheim’s career, and occurred at the end of Swanson’s. And here it is in the fictional world of Max and Norma, a symbol of days gone by. Academics can have great debates about the metaphors and similes in those strokes and echoes. Those of us who are less observant still get a riveting story, plus repeat viewings that reveal more and more each time, and the nagging sense that the artist is far smarter than we are. For only having 2 DVDs, the Centennial Collection edition is amazingly dense. There are 16 featurettes on disc 2, and there is an audio commentary on disc 1. It takes hours to pore over all of the bonus features. While this much material is a treasure trove for a student writing an essay, it’s too much for the average cinephile sitting down to rewatch one of Hollywood’s greats. After two or three featurettes, the afterglow of a four-star movie about the bitterness of Hollywood had started to fade, pushed out by the hangover of video interviews about the sweetness of Paramount’s family. Still, it’s hard to justify the purchase of such a handsome DVD (2 discs, liner notes, and a sturdy slipcase with raised lettering and metallic printing) if you don’t watch at least some of the bonus features. For starters, the audio commentary is not bad. The speaker is Ed Sikov, who wrote On Sunset Boulevard: The Life and Times of Billy Wilder. As a viewer and not a participant, he is able to make informed comments without feeling obligated to praise every performance and detail. He throws in some gems about Wilder. For example, Wilder was a gigolo in Berlin, dancing with older women for pay, and he found it demeaning. Sikov says that the theme of selling out is in many of Wilder’s works. Sikov is prepared, and he paces himself; he doesn’t just ramble or narrate. On the other hand, there are long dry stretches where he has nothing to say. If you’re rewatching the film for the first time in years, maybe that’s not so bad. Not one of the featurettes is completely fluff, but collectively they start to seem that way. When Waumbaugh starts retelling the plot of the movie, you might wonder whether he’s really adding to greatness of Sunset Blvd. The best featurettes really do add some perspective. Recording Sunset Boulevard reveals that, even though the picture won a Best Music Oscar, it never had a soundtrack release. Joel McNeely put one together in 2002 with the Royal Scottish National Orchestra. Morgue Prologue Script Pages shows the pages for Wilder’s original opening sequence, complete with links to the footage that was shot for them. The Centennial Collection edition is not a bad print, but there are scenes, especially with dark shadows, where the blacks waver in and out of detail. Perhaps it hasn’t been completely restored, or perhaps it’s as good as we’ll ever get it. The audio is encoded in Dolby Digital. It’s a monaural mix. Watch the movie and skip the extra features, because they’ll just spoil it for you. If you can’t justify the purchase without some bonus features, then stick to the ones about the film itself: the audio commentary, the script pages, and maybe the Hollywood Location Map if you know L.A. If you loved the music, give Recording Sunset Boulevard a spin. And if you have to know Swanson’s attitude toward playing a washed-up silent film star, try Two Sides of Ms. Swanson.